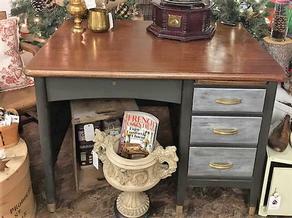 Love how this vintage very solid teacher's desk turned out! The thick mahogany slab top was stripped and redone with a Brazilian Rosewood stain then sealed with a gloss varathane. Painted with a Dark Roast / Rocky Mountain mix. Brass feet and handles revived with a pocket watch cream. Drawer fronts done with trigger cream. Very strong piece. Drawers lock. Great for the office or den.